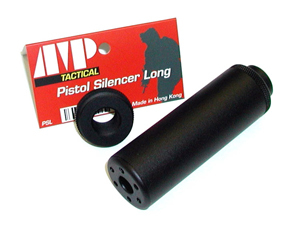 This 95mm length Mock Silencer will fit standard 14mm Anticlockwise threaded barrels and also comes with a 14mm Clockwise thread option base, for Pistols and AEGs with either 14mm threaded barrels. Great for pistols and even works with AEG's or rifles. Doesn't work... Which is good. THe recent controversy over functioning airgun suppressors has been a long and painful one, at its best. Dozens of gorgeous products were outlawed from US markets, due to functionality. THis, of course, is illegal. Now, AMP Tactical has been known now for making fantastic replicas of electronic sighting devices, including their budget-priced Tac Laser-Light unit for $99 and their new wide-field red-dot projection sight. 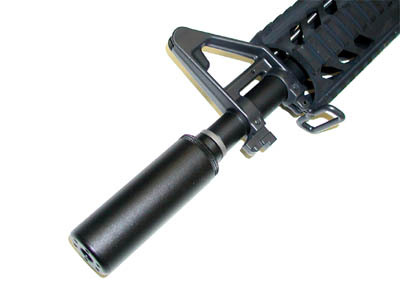 Now, they've moved into a whole new line of products: Cosmetic suppressors. G&G's gorgeous M'jutli SS80 and SS100 suppressors, which shared the same design from the outside as this model, were fitted from the factory with a foam core around a 9mm bore. This did nothing to suppress the pellet, but nevertheless, it was still illegal, and held with it the potential to endanger the buyer's gun and the seller's business. 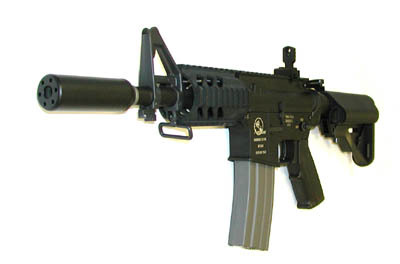 However, AMP Tactical has released this silencer, a perfect replica of the SS100, except... Legal. Beautiful, solid, and best of all, less than $30. In the interest of preserving realism, this silencer pairs best with an MP5 or P90, otherwise, it looks fantastic on pistols.